Ant is a young boy with a wild imagination. An imagination that allows him to be a bear and a dog. He also imagines a giant outside his window and experiences the careers of his dreams. 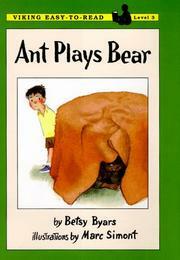 Byars, Betsy, “Ant plays bear,” Children's Picture Book Database at Miami University, accessed April 20, 2019, https://dlp.lib.miamioh.edu/picturebook/items/show/7735.